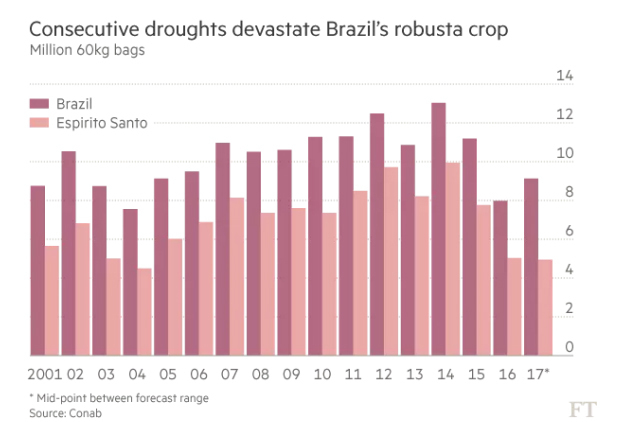 FINANCIAL TIMES — Political tensions and global prices rise after severe droughts hit robusta supplies. It has been a tough few years for Rodrigo Rigo, a coffee grower in the Brazilian state of Espírito Santo, just north of Rio de Janeiro. Hit by three years of severe droughts (http://next.ft.com/content/7c167328­1dc2­11e6­b286­cddde55ca122) in the key robusta coffee growing state, the output from his plantations have plunged by 60 per cent from normal levels and, like many other growers, been forced to accept debt relief from the government­controlled Banco do Brasil. “The people around here who are 60, 70 or 80 years old, none of them remember a drought as severe as this one,” he says. Mr Rigo and his fellow coffee growers are braced for another potential threat: coffee imports. For the first time since it became a dominant force in coffee production and exports in the 19th century, Brazil is poised to open its doors to coffee from countries such as Vietnam in the face of the country’s big robusta shortage. About 90 per cent of Brazil’s robusta beans — the lower quality coffee known as conilon — is used domestically, mainly sold to the country’s instant­coffee industry. 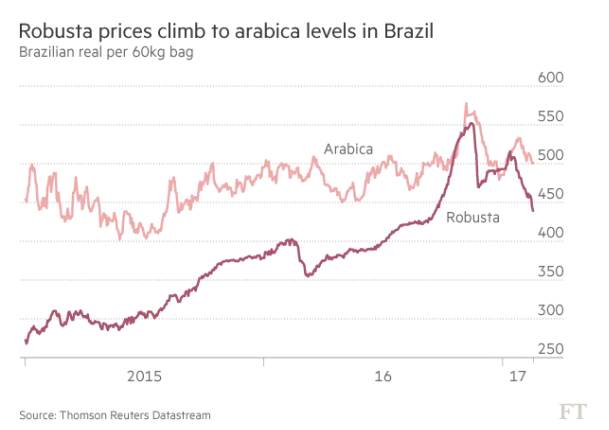 As well as driving robusta prices to record levels in Brazil, the lack of supply has helped send the international price to a five­year high. The surge in robusta prices has threatened Brazil’s instant­coffee industry’s position as the market leader. After delaying a decision for several months over whether to allow temporary imports of about 60,000 tonnes of green robusta beans, the government seems set to approve the measure. 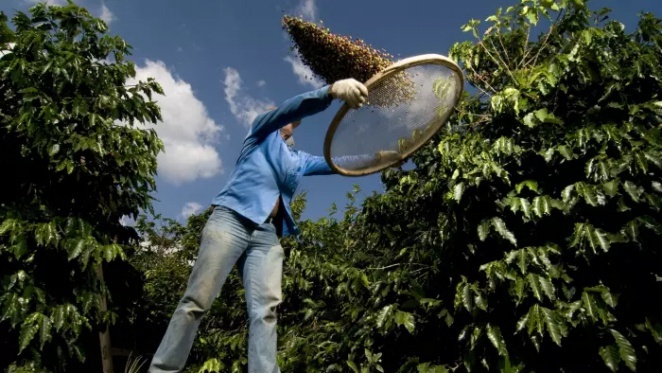 The decision to import has been referred (http://www.agricultura.gov.br/noticias/comite-vinculado-a-camex-aprova-importacao-de-cota-do-cafe-conilon) to the government’s highest authority on external trade, Camex, a board of ministers headed by Brazil’s president, Michel Temer, with the next meeting expected on Wednesday. Even though Brazil has imported roasted and ground coffee in the past, foreign green coffee beans have not landed on its shores in large volumes in the “290 years of coffee history”, according to Nathan Herszkowicz, executive director of the Brazilian Coffee Industry Association. Brazil does not ban coffee imports, but it imposes a tariff of 10 per cent, and the government is considering reducing this to 2 per cent for the permitted imports. Aguinaldo José de Lima, director of institutional relations at Abics, the Brazilian instantcoffee association, says that his members are barely coping. “The collapse in the harvest in Espírito Santo in 2015, 2016 and now in 2017 has caused a shortage so severe that the price of our robusta has reached that of arabica [the higher­quality coffee], something that has never happened before in Brazil,” he says. The local robusta price hit a record of almost R$570 a kilogramme last November, up more than 50 per cent since the start of 2016, although it has since dropped back below R$440 on speculation about imports. With the sector suffering a 35 per cent fall in export volumes in January and February compared with a year earlier, company executives have been urging the government to open up to imports or risk losing market share in the global soluble coffee market. The instant­coffee market accounts for more than a third of all coffee drinking and is growing at about 4 per cent. Although its popularity is declining among coffee drinkers in the west, instant coffee provides an entry point for emerging markets and is hugely popular in Southeast Asia and eastern Europe. Brazil shortage has also affected world prices The conilon shortage has also affected international markets (http://next.ft.com/content/0da4ec0e­d982­11e6­944b­e7eb37a6aa8e), lifting world robusta prices. Although most of Brazil’s low­quality beans are used domestically, it has traditionally exported about 1­2m 60kg bags, with the level rising in bumper years. The recent sharp falls in Brazil’s robusta output and exports have coincided with dry weather in Southeast Asia, where Vietnam and Indonesia are key producers of the lower quality bean. 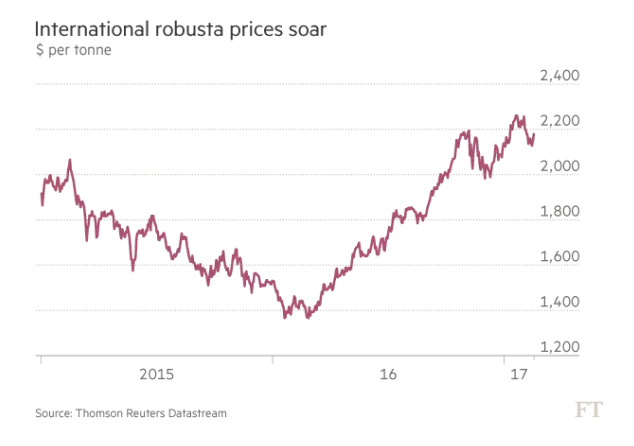 Robusta traded in London hit a five­year high of $2,173 a tonne at the start of this month, on the back of continued concerns about Brazilian supplies and renewed worries about Vietnamese output. The International Coffee Organization this month noted (http://www.ico.org/documents/cy2016­17/cmr­0117­e.pdf) the knock­on effect on the arabica market. “Roasters increasingly substitute other robusta origins or lower­grade arabica in blends, which unsurprisingly drives up prices of the arabica groups,” it says. In Brazil, roasters have substituted conilon, which traditionally accounted for about half of the ground coffee blends, with arabica. Cooxupe, the country’s largest coffee co­operative that focuses on arabica beans, says it has expanded the amount sold in the Brazilian market. “The internal market has been very strong. We increased our internal market share and decreased exports,” says Cooxupe’s Alexandre Monteiro. Coffee growers fear cocoa sector fate It comes as no surprise that robusta growers and their congressional representatives are bitterly opposed to imports. The buyers are using the drought as an excuse to prise open the market for imports, says Evair Vieira de Mello, a member of Brazil’s lower house of congress from Espírito Santo and a key defender of the state`s coffee growers, who are among its most important income earners. “They are using this moment of fragility for our business to attack our [state’s] principal product,” he says. Coffee imports would put the state’s smaller family producers out of business, leading to a concentration of the industry that would hurt the economy. Espirito Santo representatives have argued that government estimates that Brazil’s inventories of conilon of below 2m bags, considered inadequate to supply the market, are wrong and the real number is 4.4m, enough to keep roasters in business. These claims have been rejected by the minister of agriculture. The anti­import camp also points to the experience of the cocoa sector. 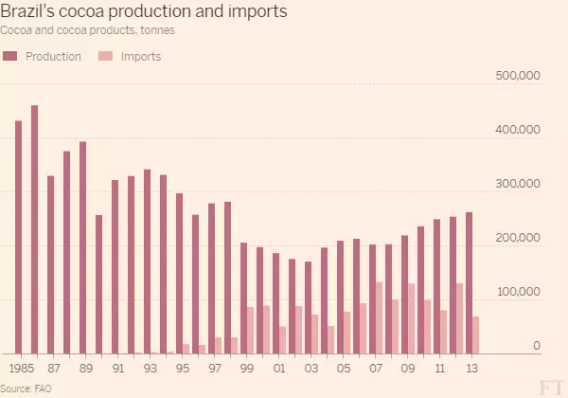 Brazil used to be a leading cocoa producer, but in a situation that was remarkably similar to the current robusta problem, opened its market to imports in the 1990s when its cocoa processors lacked the beans after several years of low output. The country’s growers could not compete with cheaper imports, and along with pest and disease, the cocoa growing sector foundered. What used to be the world’s third­largest producer in the 1990s is now seventh, accounting for about 3 per cent of total output. “For the state which depends on conilon production, the real fear is that their coffee will be replaced by coffee from Vietnam or the Ivory Coast,” says Carlos Brando, director of P&A International, a coffee consultancy. International traders could face risks Even if the government effectively approves the imports of robusta beans, it is unclear whether international traders will take the risk of bringing coffee to Brazil. The issue remains controversial domestically, and could lead to boycotts among port workers and truckers and other players along the supply chain. “There is a risk of coffee languishing at the ports,” says one London­based coffee broker. Coffee grower Mr Rigo, for one, doubts there will be a rush to import and says that he and his father before him had consistently heard similar rumours throughout their lives whenever prices climbed too high. But Abics’ Mr Lima says that to be truly competitive Brazilian growers should not fear imports.